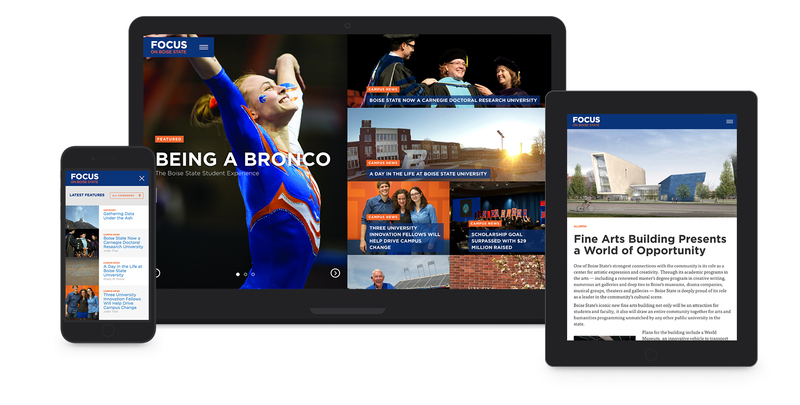 We’ve been big fans of Boise State University for over three years now, so when the team approached us with the opportunity to create a new online platform for Boise’s alumni magazine, FOCUS, we were pretty jazzed to say the least. Produced and printed semi-annually, FOCUS has three target audiences: recent alumni who’ve graduated in the past 20 years; older, retired alumni; and the greater Boise, Idaho community. Developing its first online magazine publishing platform would allow FOCUS to produce additional publications in the future and provide a user-friendly digital home for their regularly updated campus news and announcements, with less overhead and expenses than its traditional publishing model. FOCUS needed to be able to take existing print content with each issue and translate it onto the web in an engaging, intuitive layout that could be easily updated and edited. That layout also had to seamlessly transition from desktop to mobile and tablet in order to reach Boise State’s younger audiences. Most importantly, however, the digital version of FOCUS had to be extremely user-friendly to avoid alienating Boise’s aging population and losing critical readership. We started our strategic deep-dive by evaluating the different content types that appeared in FOCUS’s print version and exploring how we could most effectively support them digitally. We identified the content hierarchy for each type of article and offered several unique layout options. Ultimately, we landed on a layout that provided a media-rich experience with large, bold visuals pervading every aspect of the site, much like you’d see in a print magazine. In order to modernize the site and set it apart from other university alumni publications, we designed the homepage as a full-bleed mosaic of posts that places the stories front and center. The layout revolves around a clean, easy to scan grid with large pictures and bold headlines that immediately capture the viewer’s attention and showcases the entire breadth of FOCUS’s rich content. 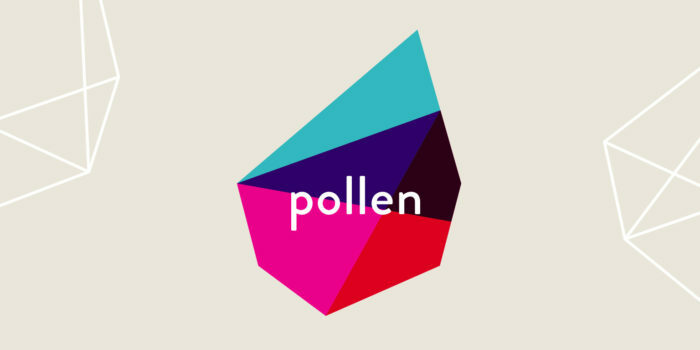 We also updated the logo, colors and typography, developing a style guide that was so successful FOCUS now uses it for their print version of the magazine as well. It’s the little details that separate a good website from a great one, so we hand-crafted every aspect of FOCUS’s digital magazine. From helpful tooltips that guide the user through the site to subtle animations that encourage readers to explore more content, no potential positive twist was left unturned. By placing an emphasis on mobile responsiveness, we brought FOCUS up to date with their younger audiences and ensured that all users have a quality reading experience regardless of the device they use. To fully embrace the power of digital publishing, we created a custom page-building system that makes it easy to quickly add features like slideshows, attention-grabbing callouts and image galleries without having to do any code. 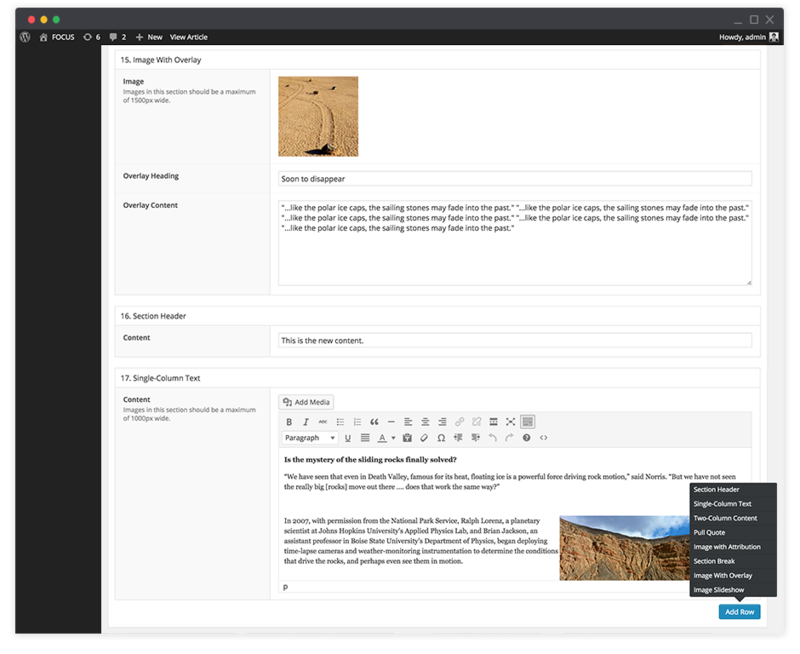 Since the FOCUS team was responsible for entering the content on the site, we customized the WordPress backend to simplify the administrative time involved. Our modular setup means making layout changes to an article on-the-fly is a snap, whether tweaking the placement of a single image or moving around entire sections of content to achieve the perfect, print-ready layout in digital form. By implementing a persistent fly-out navigation on the site, we were able to provide users with a simple, highly intuitive mechanism to browse, search and filter through published articles to easily find the content they’re most interested in. Our navigation system keeps track of the user’s recent actions, ensuring that they can quickly move from article to article without losing their place in the navigation and having to start all over again (like dog-earing a page!). Between the persistent navigation, a rich system of cross-connecting related articles, and elaborate long-form content, it’s easier than ever for users to access everything that an issue of FOCUS has to offer. The small admin team can create a unique long-format story with multiple layout options and easily embed a variety of media in just a few clicks. The project has been a huge success, allowing FOCUS to reach a wider demographic without losing sight of the usability needs of its core audience. 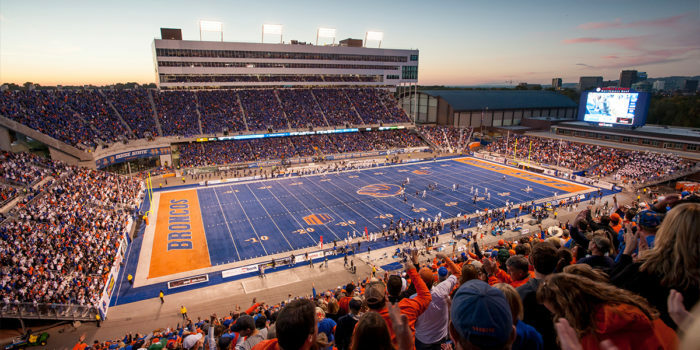 The new platform has doubled Boise State’s publishing capacity and significantly expanded FOCUS’s reach, winning multiple international design and development awards in the process. What’s more, traffic continues to climb month over month, significantly expanding the reach of FOCUS’s readership.